It has rained on Islay for 105 days in a row. But today is the 106th day, and the sun has arrived back to Islay after a long, damp, dark winter. I too, have arrived. Whether I brought the sun, or the sun brought me is moot; although sometimes I like to believe I have magical powers, it is enough to know there is magic in the place. Islay is soft earth; like many islands. Heaving with moss and peat, the hills and landscape of the island is a vessel for water that lands up high from the rain and makes its way into the lochs, then into the rivers and streams and back out to the sea. The sea itself encroaches on the island at every opportunity. The moss and grass grows down between the jagged rocks at the shoreline and the rockpools are sometimes hard to discern from the land. Soft earth, that moves under your feet but is teeming with life. Islay is soft earth; like many islands. Heaving with moss and peat, the hills and landscape of the island is a vessel for water. There is magic in this place, I’m sure of it. As I walk over shorelines and climb jutting peaks for views of the Atlantic on one side and the Lochs on the other, seals appear, head bobbing and looking straight at me. We stare at each other; the occasional head tilt from side to side. 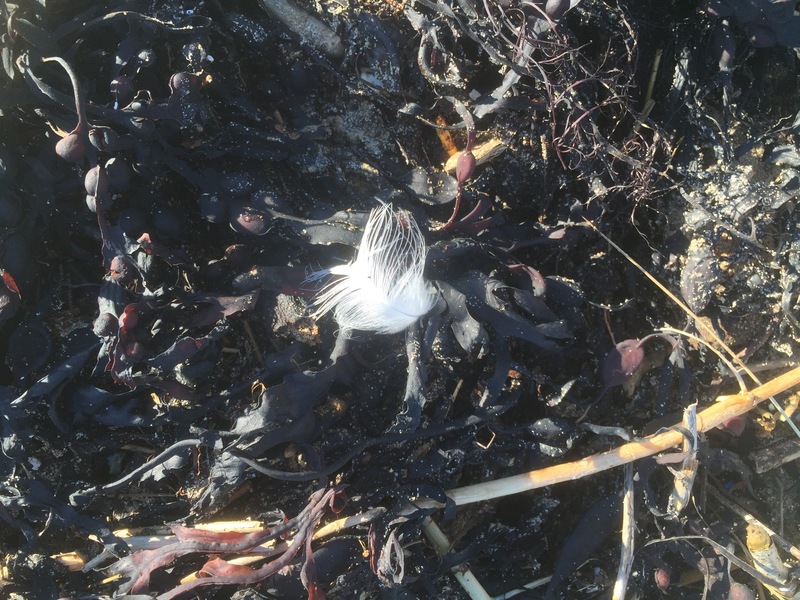 I smile and the silkie disappears below the sea crest once more in a dive, his back slick like oil and inky black against the blue of the tide. As I step, I see feather after feather along my way. There is an old legend that says when you see those small white feathers appearing around you, it’s a sign that someone is watching over you, thinking of you. I have found those feathers in the back country of Kentucky, the suburbs of Tennessee, the steps of St Pauls in London and here, in Islay – in the hallway of the Port Charlotte Hotel, on the foreshore of the Singing Seas and on the steps of Bruichladdich Distillery. Perhaps my Scottish ancestors are smiling that I’ve returned to the land of my forefathers and to this island of most famous malts. It’s remarkable that one small island of eight remaining distilleries can have such an impact on the world whisky stage. Islay malt is a thing of legend. The island is sweet to smell with her salty air, endless vegetation, and the Port Ellen maltings running from early morning til night, the warm, malty smell hovering over the bay. In Bowmore, the distillery sits in the heart of the administrative capital of Islay, just tucked into a side street. Kilchoman is a farm distillery – no distinctive stacked hats, just stone buildings tucked into pasture. Life is built around whisky here, in more ways than one but life is also more than whisky. It is people, farmland and the weather. I’ve come to Islay for the whisky, yes but more than that. To explore this tiny island of single lane roads and step back in time for a moment, going as far as I can to this edge of the world and breathing deeply. And I’m glad of it; glad for the way each passing driver lifts their hand in greeting, glad of the easy manner of suggestion and introduction. There is a hospitality here that flows easily between people and you can feel it from the moment your feet hit that soft earth. You could cover the main roads of this island in a day and still have time to spare. 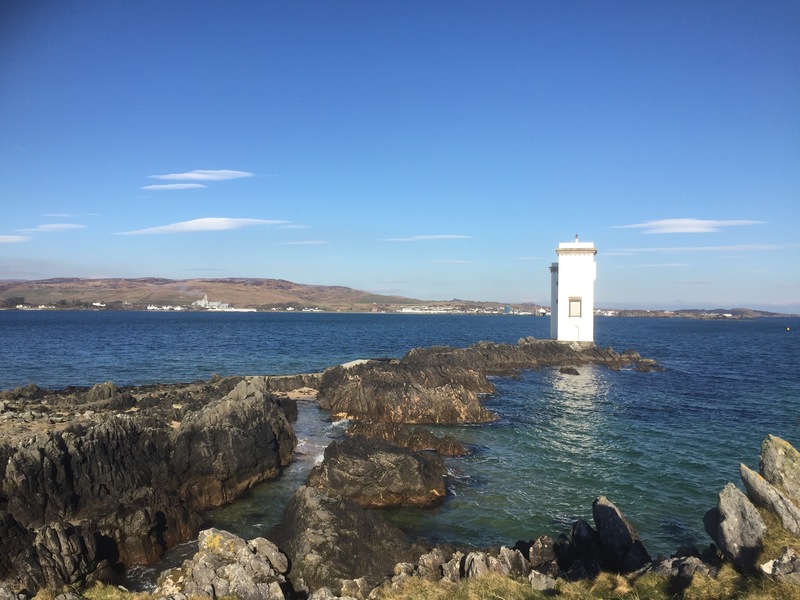 Villages might be as small as six houses, but there are coves and hills, lochs and lighthouses to see as well as 8 distilleries in operation, running tours and tastings. The best way to stay on Islay is at one of the local hotels or in the myriad of guesthouses and B&Bs. They are all over the island, in every crevice. Beyond the long road that runs past Laphroaig, Lagavulin and Ardbeg, I reach the Kildalton Cross. Amongst this graveyard there are stones are carvings that seem to predate words, ancient Celtic carvings alongside burials as recent at 1903. 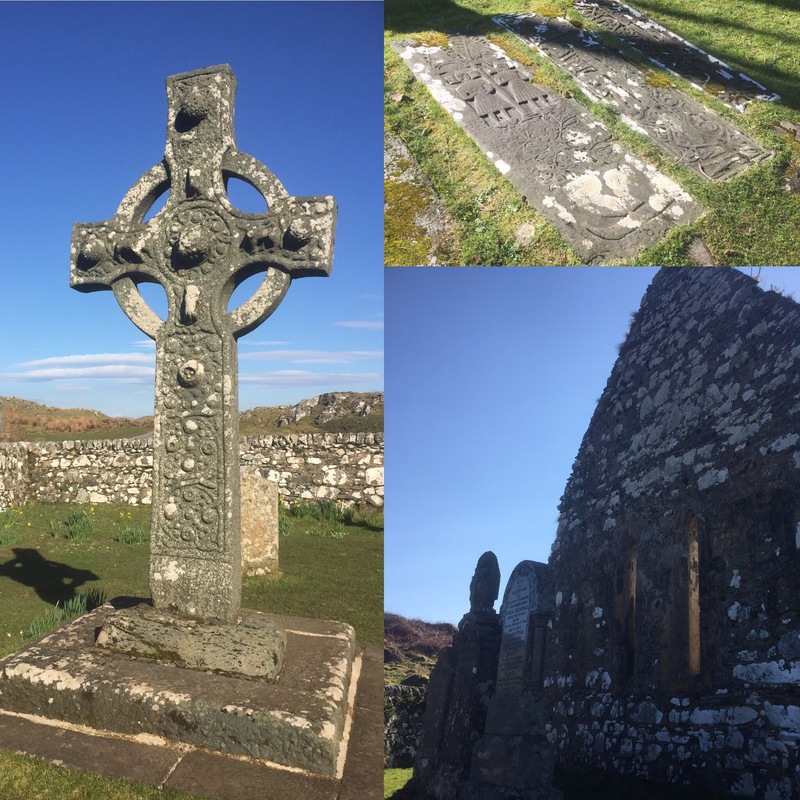 The gravesites are littered inside and outside of the ruin of a church and outside it, the Kildalton Cross. There is an old spirit in this place for certain, echoed in more than just the ruins that scatter the shoreline. At Lagavulin, the church used to be beside the distillery but it was moved to make room for a carpark, only to have the church bell returned to the hilltop overlooking the old malthouse. It’s bad luck to move a church bell, they say. There is old magic here. At the Mull of Oa, there is a square lighthouse that marks the entrance to the channel. Behind that lighthouse, a flock of wild goats that have free run of their hill and the coastline there. A colossal bull with ivory horns turns to stare me down as I walk past him. I can’t resist the urge to poke my tongue out at him and he, unimpressed I assume, turns away again. I laugh out loud and he looks back, but it’s impossible to be here and not feel connected to the land and all that lives on it here. Islands, and island people have much in common no matter where you find them. They make life from what the island gives them. In this instance, the farms are full of fat cattle and sheep and the whisky makers are happy; very happy. I have eaten salmon from local Loch Fyne, venison from the central hills and fennel grown wild with homemade bread that yearns for Scottish butter. I oblige happily; and indulge in Botanist gin, made with 22 botanicals foraged from the island. There is a married couple, botanists, who were enlisted by Bruichladdich to help them create an Islay dry gin. It’s delicious and comes in a bottle the shape of the square monument. Bruichladdich has become my favourite of the Islay malts, by nature of their people. The warmest and kindest of all the whisky people I have met. Mary is a kinswoman as soon as we meet and the hour or so I spend wandering the distillery with her will stay in my mind a long while. A family-style business despite having lost their independent status, what they haven’t lost is their progressive approach to single malt. Late at night once my exploring is done, I venture onto the top of the hill that heads out to Kilchoman Farm Distillery. Word is that the Northern Lights will be making an appearance in the clear skies overhead and what few town lights exist on Islay disappear up here. I sit out in the dark, nothing but the wind and the stars beside me. I can smell the peaty residue in the air from a fire burning on the west side of the island. I saw it earlier and because there is no wind, it hangs in the air. Somewhere to the east of me, there is a riverlet running, I can hear it gently trickling down the bank. That water is likely clear as glass but inky brown, like all the water that runs through the peat banks. While technically spring, the earth will need a few more days of sunshine before the islanders can start cutting the peat. Too soft, it won’t burn but too dry it will crumble. 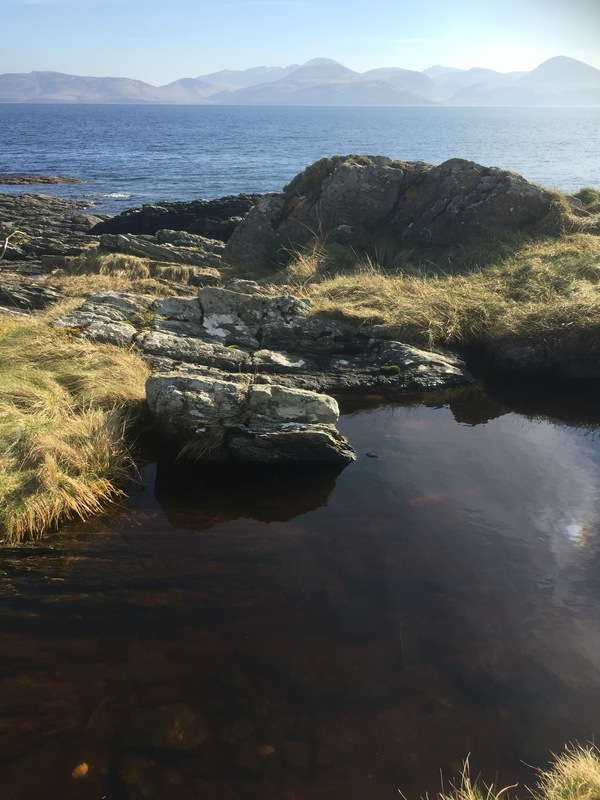 It’s impossible for me to think of Islay without thinking of peat, but the truth is you can only smell the smoky, iodine nature of it once it’s burning or faintly in the water. The water runs gently, the faint smell of smoke is in the air and then, just a hint of green glow starts dancing on the horizon. It’s not as dramatic as I was expecting or hoping for, but as my eyes adjust, I see it stretching up and then rolling, listing slightly to the left. In an unexpected turn, not only has Islay given me sunshine but she’s also given me the lights. There is magic running in this place. I have tasted whisky straight from the cask here, roamed on hills and rugged coastlines, breathing deeply of this rich, island air. As I drive out to meet the early morning ferry back to mainland, I see great flocks of birds dancing in the morning light. The dawn is slow here, taking from just before six in the morning to half-eight. Their graceful dance against the indigo sky is mesmerizing. Even the skies above this soft and fertile earth are alive. 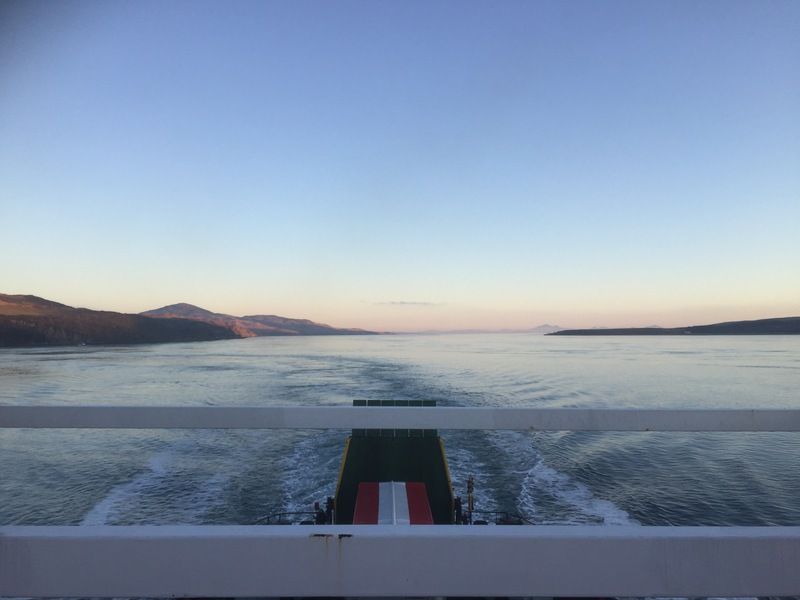 The two hour ferry crossing back to mainland sees me leave the sunshine behind, a gentle grey blanket resting over Kintyre. The sun is trying to push through with the same urgency that the boat pushes through the current. I came to Islay for whisky but I found magic and I leave, hoping I have breathed some of that magic into my bones and blood.